Buying a home is not the same as buying a stock, a refrigerator, or even a car. It is not just a product with pluses and minuses - good school system vs. small kitchen, new roof vs. longer commute, etc. A home (to a large degree) represents the kind of life you want to live. And given its cost, a house and the marketable value it gains (or loses) represent in a very concrete way the life you will be able to live. Thus, it is both expected and disturbing to realize our judgment about real estate is susceptible to many of the foolish forces that affect so many other consumer buying decisions. Fresh look: It is not just the fresh paint job of a property that lures Buyers, but the more attractive the real estate agent who is showing a house that motivates a Buyers’ decisions, and potential willingness to pay more, research shows. Refusing to lose: People who buy homes near the peak of a boom tend to list them at higher prices, even if that means they don't sell. Blame it on "loss aversion," the mental quirk by which we feel losses much more sharply than we feel equivalent gains. My home is better: Homeowners consistently overestimate the value of their homes by 5 to 10 percent. The only group that is an exception are those who bought during a market slump (downturn). Buyers getting in now may be at a cognitive advantage for years to come. Boom buyers, however, have to come to terms not just with economic losses, but with psychological losses as well. This morning saw the publication of the FRB's quarterly Z-1 report for Q1 2012, a lengthy summary of statistical data centered around the banking and credit system. The report is best known for its summary of total debt outstanding in various categories including Federal Debt (up 3.11% for the quarter at $10,778 bln), Business Credit (up 1.25% for the quarter at $8,166 bln) and Household Credit (down 0.08% for the quarter at $12,919.2). Household Credit is made up of Consumer Credit ($2,544.4), which is now growing quite quickly at 1.44% for the quarter (largely due to student and automobile loans) and the much larger category of Mortgage Credit, which continues to shrink, falling -0.73% to $9,747 bln, its lowest level since Q3 2006 (it should be noted that Mortgage Credit is not actually measured by the Fed, but is imputed as a "residual item" left over from other data inputs from banking system data). This drop in the estimation of Mortgage Credit Outstanding finally takes this number back below that of Outstanding M2, which at the end of Q1 2012 stood at $9,798. Back in 2007 at the start of the housing crisis, this spread was above $3,000 bln, a reflection of excessive credit growth and a lack of monetary creation by the FRB. 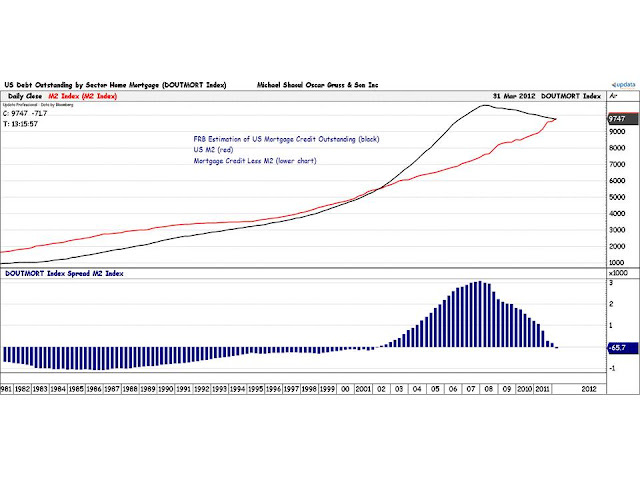 At the time, we used this spread as a reasonable proxy for the degree of excess in the mortgage credit system and suggested that a recovery from the coming collapse (the very existence of which was still hotly contested in 2007) would have to wait until this spread was closed. We continued to track the spread for several quarters as the scale of destruction from the US housing market spread out into the wider financial system. 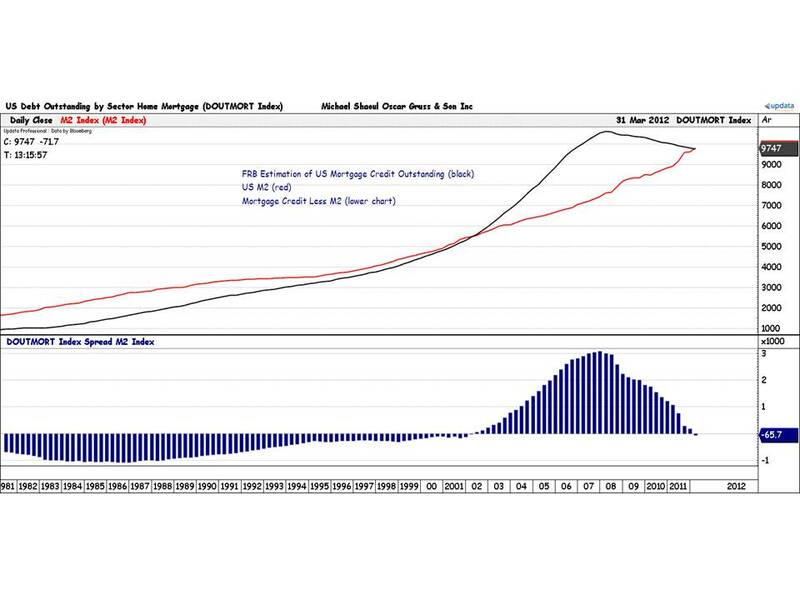 In the spirit of full disclosure, we expected Outstanding Mortgage Credit to fall further and M2 to rise less (I seem to recall we expected a cross to take place between $8,500 bln and $9,000) but this was because we underestimated the degree of emergency policy the FRB would undertake and frankly we are happy to have been proved wrong in this respect. The bigger issue though is the fact that sufficient monetary creation and debt write-down have taken place to put these two metrics back in historic balance. This is a big deal in my opinion and I am unsurprised to see this take place against a backdrop of a moderate but persistent recovery in both new and existing home sales. - Credit is broadly defined as the transfer of money from one period to the next. - When Credit expansion rises in excess of the money supply, M2, this is how artificial “bubble” pricing is achieved. - Normalization is under-way; confidence is restoring; stability ahead.